After years of the same old, same old, optical lenses have recently enjoyed a paradigm shift, making it easier than ever to wow your customers. Anyone who has worked in an optical dispensary knows that people wearing really dirty glasses are usually completely oblivious to the murky view before their eyes. Something as simple as a squirt of cleaning solution and a quick rub with a high-quality cloth can make a huge difference. Educating the consumer about what a difference new lens technology can make is akin to the cleaning ritual. True, it can be a challenge to convince people to buy something they cannot fully appreciate until they have actually spent the money. But here’s where stories about others who have enjoyed the benefits come in handy. Price no longer needs to be a barrier to experiencing the benefits of new lens technology. While cost is often associated with quality, even the least expensive free-form lens is superior to conventional products, according to Paul Faibish, president of Plastic Plus. And premium high-tech lenses are coming down in price, too, as equipment costs decline. 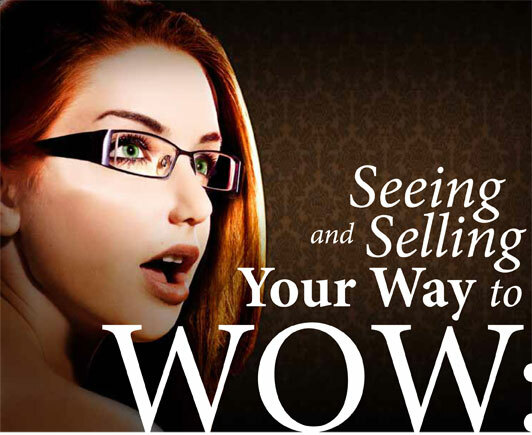 Let’s take a look at some of the new lenses, coatings and equipment that will make your life easier as you create the wow factor for your customers. HOYA is one company that has gone above and beyond to make it easy for eyecare professionals (ECPs) to excel at selling the latest lenses. For example, the MyStyle Identifier is an easy-to-use online patient consultation and ordering system designed for the new HOYALUX iD MyStyle progressive lens. HOYA has two new high index polarized lenses, 1.67 NuPolar single vision and polycarbonate IMAGE polarized progressive. Both are available in AR packages. The company also added 1.50 polarized brown as a colour option for its Hoyalux iQ Summit ecp and Summit ecp PALs. C & C has two additional fully integrated digital lenses ready for release, pending final testing results from ECPs. Civello adds that all lens products — conventional lenses and digital — and all lens treatments are available from C & C. As an optician, he prides himself on amazing service and the fact that he lends his personal technical support to ECPs who call with questions. With over 35 successful years in the lens business, Civello has the personal touch along with great pricing, warranties, and fast delivery. The INNOVA lens edging division offers new features in the award-winning Nidek ME-1200 multifunctional edger. Smaller than its predecessor, this machine measures lens thickness to ensure correct placement of the bevel or groove, as well as the diameter of the existing lens to determine where and how much pressure to exert for optimal results. With features too numerous to mention, this Silmo d’Or award-winning system is truly impressive: “Powerful but silent,” according to Business Development Manager Wayne Metelsky. SEEMAX Power AP is a personalized, double-sided digital progressive lens using the advanced Nikon calculation system. Each patient’s data is sent to Japan for personalized design (using parameters such as wrap angle, pantascopic tilt, and vertex distance) and then transferred back to Canada where it is manufactured. Nikon strongly believes that eyecare professionals must be involved in the fitting and ordering of lens products. Discenza emphasizes that Nikon has made a conscious decision not to offer their products to optical web retailers. Over 75 years ago Carl Zeiss Vision invented AR coatings. Now they are defining the category once again with PureCoat™. Available on finished lenses from Carl Zeiss Vision and Centennial Optical, the ultra-tough hard coat provides up to 50 per cent more scratch resistance than other leading AR coatings, based on tests conducted by COLTS Laboratories. PureCoat 1.74 super high index lenses have also been recently added to the PureCoat offering, while the 1.50 index, polycarbonate, 1.60 index and 1.67 index lenses were introduced at the beginning of 2011. The 1.74 is a double-side aspheric that corrects power errors and marginal astigmatism in peripheral areas. With a 1.0 mm center thickness, the lens offers a 32 Abbe and 100 per cent UVA/UVB protection. Centennial and Carl Zeiss Vision are also proud to be the distributors of NXT technology sun lenses. Using Trivex® lens material, NXT® options include fixed tint, photochromic and polarized lenses. With a 45 Abbe value for clarity and great chemical resistance for long lasting quality, these lenses are perfect for golfing, biking, driving or skiing. Coburn Technologies makes in-house lens processing easy, whether your practice is large or small. Just released this year is the Coburn CTL85 DP, a compact, dry-cut lens generator that uses no water or water management system. Designed to work with the CTL85 DP, Coburn’s LaunchPad™ is another innovative, patent-pending disposable free-form processing technology that allows for easier and more cost-effective polishing of free-form lenses. The proprietary material configuration of LaunchPad, combined with Coburn’s patented disposable foam lap allows for free-form polishing on a traditional cylinder machine (such as the Coburn CMX50 and/or Acuity Plus), thus eliminating the need for larger, more costly free-form polishers. Together, the Coburn CTL85 DP and LaunchPad eliminate the need for an industrial polisher. Free-form lenses can be polished on an as-needed basis, using smaller polishing machines that most small labs already have on hand. Optical practices with limited lab space can bring their free-form lens production in-house, thanks to Coburn. Faibish claims that within 36 months conventional lens technology will be a thing of the past. The one area where he finds ECPs slow to pick up on the benefits of free-form is in single vision lenses. As he points out, “There’s a huge market here. Patients love them as much as they do the free-form progressives, and the added cost for a second pair is minimal.” Plastic Plus is offering a sweet deal of only $10 extra per pair for single vision back-side free-form lenses. An advanced digital lens optimized for wrap frames is now available from Essilor. Even presbyopes can enjoy wide fields of vision without sacrificing optical quality. The Essilor Wrap DS lenses fit most wrap-around frames. Available in six and eight base curves, they are adapted to each wearer’s needs via Essilor’s patented calculation process that takes vertex distance, pantoscopic tilt and wrap angle all into account to optimally refine the lens. And starting this October, the new Varilux Computer DS will replace the previous version of the product. This lens effectively addresses the needs of eight out of 10 eyeglass wearers who suffer from visual fatigue when using a computer, according to an Essilor news release. Designed to reduce visual discomfort, the Computer DS provides a wide intermediate zone for a natural head position when working at the computer. PhysioBrown 15 has been added, which filters out harmful blue light and improves contrast while maintaining colour perception. Rodenstock has released several lenses this year including an improved version of their highly successful Colormatic photochromic treatment, which is available in 1.6 and 1.67 plastic lenses. “This is the fastest lightening photochromic plastic lens on the market,” says National Sales and Marketing Manager Martin Bell. Rodenstock has an app for the iPad that allows the dispenser to show the customer the difference between conventional progressive lenses and high-tech digital free-form lenses in a very graphic way. They also have a promotion that allows dispensers to earn an iPad with their lens purchases. Vision-Ease Lens recently introduced a new VELA Poly FSV AR lens to their FSV line. The new lens offers outstanding clarity, low reflectivity and high abrasion resistance with an excellent Bayer rating for superior scratch resistance. Those seeking a healthy profit margin would do well to look at this offering, according to Senior Product Manager John Bator. Vision-Ease has also released LifeRx FSV lenses in grey. The new LifeRx FSV lenses and their SFSV counterparts are 100 per cent interchangeable due to matching front curves on both lines. Interestingly, LifeRx lenses are manufactured with 100 per cent renewable energy. They also deliver superior photochromic abilities with rapid darkening, industry-leading fade-back speed and excellent indoor clarity. LifeRx lenses are available in a power range of +2.00 to -6.00, to a -2.00 cylinder. Signet Armorlite is well-positioned with both its Digital Design Technology™ and public confidence in the KODAK Lens brand. Digital Design Technology creates a complex, precise, three-dimensional back surface, which improves the optical performance of the front-surface progressive designs for the KODAK Precise® Digital Lenses, along with the KODAK Precise Short and KODAK Concise® Digital Lenses, both of which are designed specifically for small frames. This technology also allows flatter base curves, giving lenses a more appealing cosmetic appearance without sacrificing optical performance. According to Signet Armorlite, this technology provides more consistent optical performance, based on typical wearing conditions, over the range of prescription powers. With the reduction in wavefront errors, wearers can expect sharper vision in the principal viewing areas of the lens as well. Signet Armorlite has another propriety lens design technology. Vision First Design™ directly controls the surface power at virtually every point on the lens. The result is a smooth power increase across the entire lens, top to bottom. Vision First Design is used to create KODAK Precise PB and Precise Short PB Progressives, which are digitally created full backside progressives with a wide field of view. Transitions® XTRActive™ lenses are the ideal choice for those who spend a lot of time outdoors in bright, sunny conditions, and who value an everyday, adaptive lens that offers superior outdoor darkness in all temperatures. As with Transitions® lenses, Transitions XTRActive lenses are known for visual comfort both indoors and out, while offering automatic UV and glare protection. Where they differ is in the fact that they were developed with photochromic dyes that activate in the lower spectrum of visible light, in addition to UV light. Because of this, Transitions XTRActive lenses also provide moderate activation behind the car windshield and are designed to have a light tint indoors. The latest Transitions XTRActive lenses include 1.50 index and FT-28 bifocal designs. Sports enthusiasts can benefit from Transitions XTRActive lenses as can those who are in and outdoors in all kinds of weather, such as delivery and home service providers. As we move toward 2012 there’s a fabulous array of exciting lens products to help ECPs make a great impression. “Wow” is a word you should be hearing from your clients more often than not, especially with today’s digital free form lenses.